Markets I have 37 years of experience forecasting global financial markets. Changes in interest rates can have positive and negative effects on U.S. financial asset prices. When the Federal Reserve Board (The Fed) changes the rate at which banks borrow money, this typically has a ripple effect across the entire economy including equity prices, bond interest rates, consumer and business spending, inflation, and recessions. However, there is often a delay of a year or more between when interest rates are initially raised, and when they begin to have a tangible effect on the economy. As consumers, though, we feel these increases much sooner — especially in the floating rate debt we are holding including credit cards, student loans, home mortgages, and equity loans – all which move right along with the Fed. U.S. interest rates have actually been been rising for a while, now, but at a glacier-slow pace that many people would have not noticed unless they were in the business of tracking them like we are. 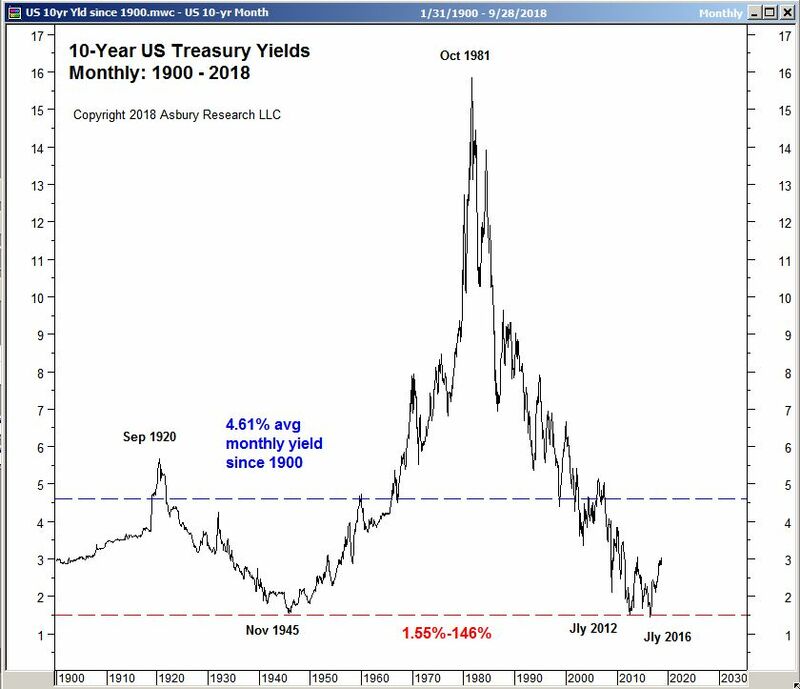 Our research strongly indicates long term US interest rates are at a secular decision point, one that is likely to eventually be resolved by significantly – if not surprisingly — higher borrowing costs over the next one to several quarters. The Federal Reserve controls short term interest rates. The Fed is is currently in the midst of a hiking cycle that began at 0.25% in December 2008. The S&P 500 actually bottomed three months later, in March 2009, shortly after President Obama first took office. Short term rates have slowly risen since then, by another 50 bps to 0.75% in late 2016, by an additional 75 bps to 1.50% in 2017, and by another 75 bps to 2.25% thus far in 2018. The market controls long term interest rates. The 10-Year Treasury Note is the most widely tracked government debt instrument in finance, and its yield is often used as a benchmark for other interest rates including corporate bonds, agency bonds (Ginnie Mae, Fannie Mae, Freddie Mac), and mortgage rates. Chart 1 below, a monthly chart, shows that the 10-year bottomed near 1.50% twice – at 1.51% in July 2012 and at 1.46% in July 2016, and is currently at 3.07%. The only other time US 10-year yields were as low as 1.50% over the past 100 years was in November 1945, at the end of World War II. 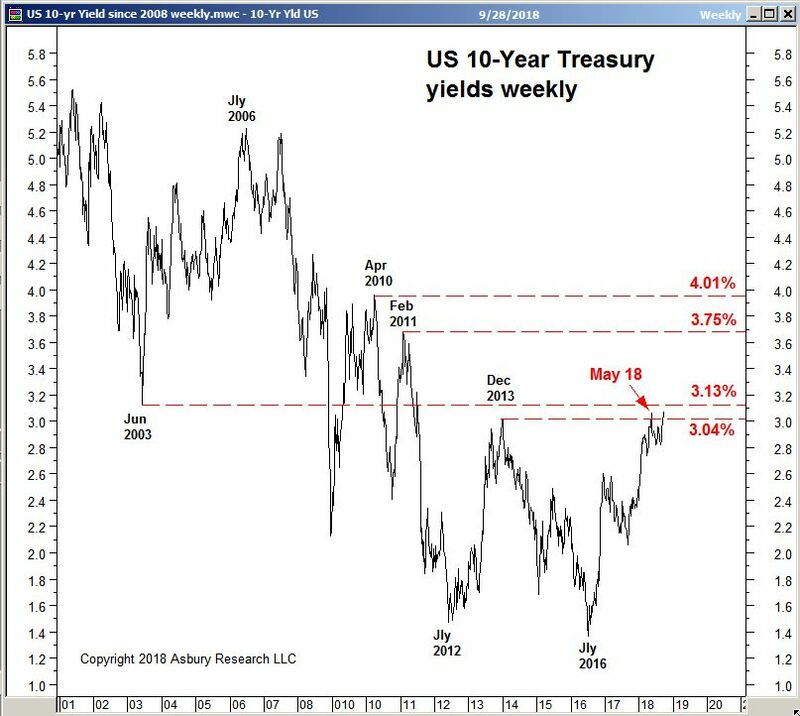 Chart 2 below takes a more recent look at 10-Year Treasury Note yields, plotted daily since 2001, and shows that 3.13% is actually the June 2003 secular benchmark low — which was already tested as yield resistance for the first time back in May. Long term US interest rates typically make relatively quick moves from major level to major level, which are typically previous historic highs and lows, often with long quiet periods in between. Following almost a decade of historically low long term U.S. interest rates, much of which was in response to the 2008 Financial Crisis, inflationary pressures finally appear to be increasing. Meanwhile, the yield of the benchmark 10-Year Treasury Note is testing secular overhead resistance at 3.13%, its June 2003 low. A sustained rise above 3.13%, which appears likely considering the Federal Funds rate has tripled to 2.25% since 2017, would clear the way for a potentially quick move to the next key levels at 3.75% and 4.00% by as soon as late 2018 or early 2019. Although rising interest rates may indeed have a more gradual effect on the broader U.S. economy, they will probably have a more immediate effect on consumers financing debt at a floating rate via credit cards, mortgage and home equity loans, and student loans. Consumer spending currently comprises 68.0 percent of the U.S. economy, and U.S. household debt has risen over the past 18 months — especially in floating credit card debt which is up 2.6 percent according to the Federal Reserve Bank of New York, Center for Macroeconomic Data. These factors support our expectations for a sharp and significant rise in U.S interest rates, particularly in long term rates. Should this occur, we would expect it to have a meaningful adverse effect on the US economy in 2019, as well as on U.S. equity prices which are strongly influenced by economic trends.